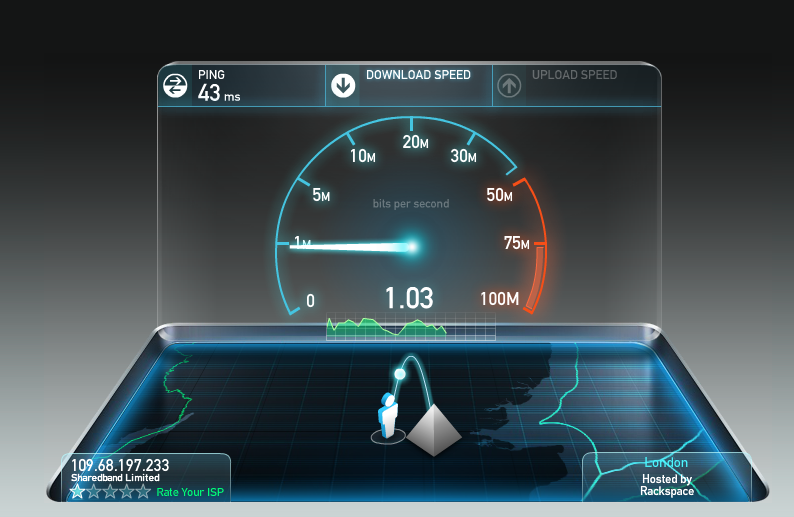 Premier Inn Wifi – If only it were consistent. I recently heaped praise on Premier Inn for providing a good wifi service in one of their hotels. Sadly, this is not consistent across all their properties. I’m currently staying in another Premier Inn just down the road from the one with the good wifi (which was already full for this evening). This is as good as it got. Fail. It does have sensibly laid out 5GHz and 2.4GHz spectrum like the other Premier Inn, so it seems the wifi architecture is sound, however what’s different here is the backhaul technology. The other property was on what appeared to be a VDSL line from a more specialist business ISP. It also had the advantage that it was only shared between about 20-odd rooms. This Premier Inn is much larger, but based on the ISP (Sharedband) it is likely to be using a link-bundled ADSL2 connection, and is shared amongst many more users – about 140 rooms. I’ve noticed several other Arqiva-managed hotspots using Sharedband as the backhaul technology, and these all have suffered from very slow speeds, high latency and signs of heavy oversubscription and congestion. Notice the “star rating” on the Speedtest above. One star. Lots of unhappy punters? It would be great if Premier Inn could offer a more consistent experience in it’s wifi product, and I mean a consistently good experience such as the one I enjoyed just up the road in Abingdon, and not the lowest common denominator of the congested barely useable mess here. They aim for a consistent product in the rest of their offerings and for the most part achieve it, however if I was only staying here in this property, I’d be asking for a refund for the wifi charge. I can just about get 3Mb/sec down (and less than 256k up) out of the connection here now, and I assume the large majority guests are sleeping. Still less than great. This is very obviously based around oversubscribed link-bundled ADSL stuff. Previous Previous post: Driving in Malta – signs of madness?